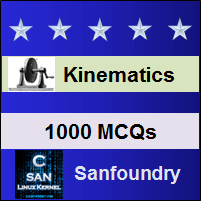 This set of Machine Kinematics Multiple Choice Questions & Answers (MCQs) focuses on “Numericals On Kinematics Of Motion”. 1. A car starts from rest and accelerates uniformly to a speed of 72 km. p.h. over a distance of 500 m. Calculate the acceleration. First of all, let us consider the motion of the car from rest. Let a = Acceleration of the car. 2. A car starts from rest and accelerates uniformly to a speed of 72 km. p.h. over a distance of 500 m. Calculate the time taken to attain the speed. Let t = Time taken by the car to attain the speed. 3. A car starts from rest and accelerates uniformly to a speed of 72 km. p.h. over a distance of 500 m. If a further acceleration raises the speed to 90 km. p.h. in 10 seconds, find this acceleration and the further distance moved. Now consider the motion of the car from 72 km.p.h. to 90 km.p.h. in 10 seconds. 4. A car starts from rest and accelerates uniformly to a speed of 72 km. p.h. over a distance of 500 m. A further acceleration raises the speed to 90 km. p.h. in 10 seconds.The brakes are now applied to bring the car to rest under uniform retardation in 5 seconds. Find the distance travelled during braking. 5. A wheel accelerates uniformly from rest to 2000 r.p.m. in 20 seconds. What is its angular acceleration? Let α = Angular acceleration in rad/s2. 6. A wheel accelerates uniformly from rest to 2000 r.p.m. in 20 seconds.How many revolutions does the wheel make in attaining the speed of 2000 r.p.m.? 7. A horizontal bar 1.5 metres long and of small cross-section rotates about vertical axis through one end. It accelerates uniformly from 1200 r.p.m. to 1500 r.p.m. in an interval of 5 seconds. What is the linear velocity at the beginning? 8. A horizontal bar 1.5 metres long and of small cross-section rotates about vertical axis through one end. It accelerates uniformly from 1200 r.p.m. to 1500 r.p.m. in an interval of 5 seconds. What is the linear velocity at the end of the interval ? 9. A horizontal bar 1.5 metres long and of small cross-section rotates about vertical axis through one end. It accelerates uniformly from 1200 r.p.m. to 1500 r.p.m. in an interval of 5 seconds. What is the normal component of the acceleration of the mid-point of the bar after 5 seconds after the acceleration begins ? Let α = Constant angular acceleration. 10. A horizontal bar 1.5 metres long and of small cross-section rotates about vertical axis through one end. It accelerates uniformly from 1200 r.p.m. to 1500 r.p.m. in an interval of 5 seconds. What is the tangential component of the acceleration of the mid-point of the bar after 5 seconds after the acceleration begins ?